Wife Works To Free Pastor From Iranian Prison Iranian-American Saeed Abedini converted from Islam to Christianity in 2000, and is a pastor of a church in the U.S. Now, he's serving time in an Iranian prison on charges of disturbing national security. NPR's Rachel Martin speaks with Naghmeh Abedini, his wife, about her husband's imprisonment and her campaign to get him released. 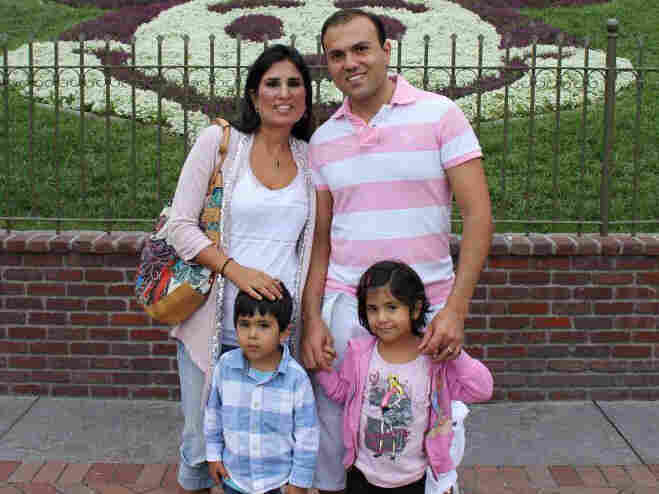 Saeed Abedini continues to miss family trips, birthdays and anniversaries. His wife, Naghmeh, is working with the American Center for Law and Justice to have him returned home to his family. Naghmeh Abedini's Iranian-American husband converted from Islam to Christianity 13 years ago. Since then, Saeed Abedini has made many trips to Iran, most recently to build an orphanage. But he was detained by Iranian authorities in 2012. "We were working with [the government]" on the orphanage, Naghmeh Abedini tells Martin, "and very unexpectedly, they put him under house arrest, and we were shocked when they took him." In January, he was sentenced to eight years in prison on charges of disturbing national security. Saeed Abedini is serving his sentence at Evin Prison, which his wife calls "one of the most horrific prisons in the world." Some prisoners are allowed to call their families several times a week, but he is not granted that liberty. His parents visit weekly, though, and are able to speak with him about how he's faring. He has told his family he has lost some of his eyesight and memory after time spent in solitary. He has also endured beatings, and, says Naghmeh Abedini, "was told he would be released if he would deny his Christian faith and return to Islam." Pretty much one of the most powerful things that happened to him, that converted him, is that he had a vision, or some kind of encounter with Jesus, where he saw Jesus and he told Saeed that he's coming back soon and to go preach the gospel. And so he converted and started sharing his faith. Still, he continues to proselytize to his fellow inmates. "He sees hopeless people in that prison," says Naghmeh Abedini. "And I know the only thing Saeed can offer them is his faith, his hope that there's a god and they can have a relationship with god, despite where they're at." And Naghmeh Abedini believe she is close to finding a way to bring her husband home. She was recently able to hand-deliver a letter Saeed Abedini wrote to a delegate for Iranian president Hassan Rouhani, and President Obama also asked about him in a call with Rouhani. "These are very hopeful signs," she says. "I don't give my kids a timeline, but I'm very hopeful that we would see him home soon." Do you think the U.S. should trust Iran's recent overtures? Tell us on Weekend Edition's Facebook page, or in the comments section below.